There's something about boys and fishing: an iconic all-American image that defines the joys of a childhood summer. Two young boys sit on the edge of a dock, fishing poles angled toward the water, furrows of concentration on their little faces. Replace the dock with a pristine rushing river, position said boys at the edge of an eddy, replace this spinning pole with a fly fishing rod and you have Sun Valley at its finest. It was with this picture in mind that I set off Sunday, July 29, to take my 7-year-old son, Matthew Letourneau, fly fishing. I imagined his joy at hooking a rainbow trout, his gratitude to his mother for introducing him to this magical sport. The promise was of a sun-kissed day, a delighted child and a perfect summer outing. Joining us on this adventure, and increasing my confidence in this undertaking considerably, was my very own "ringer." Matthew's good buddy Will Ring, and his father, Terry, who just happens to own Ketchum's Silver Creek Outfitters, were our fishing buddies du jour. With a Zen fisherman like Terry along, I knew that what I like to call the "technical stuff" would be handled seamlessly and I knew he would quietly undo any of the bad habits I was unintentionally passing along to my son. We set off and armed ourselves with the fundamentals of any trip that involves recreating with children: Goldfish crackers, plenty of water, secret snacks and a change of clothes. Also in my pack? Two "emergency" beers for the adults. First stop was to the fly shop to pick out flies. Truthfully, we could have ended the day right in front of those enticing cases of tied feathers, thread and fur. The boys made a painstaking examination of each terrestrial, nymph, streamer and fluffy dry fly before finally selecting their allotted five. What came to the pond with us was a wildly diverse assortment: from the tiniest bead-head nymph to enormous neoprene grasshoppers and San Juan worms. Will tucked a 12-pack of night crawlers into his vest, too. Finally, we arrived at the super-secret fishing spot north of Ketchum, giddy with anticipation. The boys tumbled out of the backseat and made a beeline for the water. Anyone who loves to fish knows that the water actually calls to you. The sound of the river breaking over rocks, the mineral smell of the Big Wood and the feel of the slick rocks beneath your water shoes compel you to come on in. Anyone who has young children similarly understands that coercing them to begin an activity without letting them explore their surroundings is a recipe for disaster. This particular super-secret fishing spot was located on property that boasted an amazing tree swing that arcs high over the river. To the boys, the swing proved much more compelling than assembling rods or tying on leader. Thus, the adults assembled and the boys swung. With rope-swinging out of their system, it was on to step two in the process of fishing with children: time to move into the water. I counted down from 10 and, on cue, the rocks began to fly. Will lobbed a rock into the river and it went kerplonk. Matthew answered. Why is it that kids have the innate ability to throw rocks exactly into the pools and foam lines where fish are most likely to hold? Thankfully, Zen fisherman Terry was able to quickly turn their attention to searching for bugs underneath the rocks before they could ruin every fishing spot. In a funny variation on a matching game, the boys flipped stones. The first that Matthew turned over was the resting-place for a tremendous golden stonefly. Will responded by turning over a rock with a caddis holding on for its life. They were simply amazed at the number of insects living under the water's surface. Thirty minutes and one snack later, the boys were thinking about being ready to fish. When asked if they'd like to practice casting, perhaps the trickiest aspect of the sport, Matthew replied, "No thanks, I'm a great caster." That being the case, we were able to entice them to practice on the bank of the pond before going live with a hook. Amazing things happen with a promise of a Popsicle. It was then time for the big show. It turns out that both Will and Matthew were good little casters, laying straight lines to where the fish were feeding. Will quickly hooked one, then two. Calling loudly for the net to help land the behemoth 6-inch fish, Matthew scrambled down the bank with the net only to see the fish unhook itself. For Will, the third time was the charm as he caught a much larger brightly colored rainbow and reeled it to shore. With their attention level exhausted, it was time to swing again. And have a snack. Properly refreshed and refocused, it was Matthew's turn at the proverbial wheel. Quickly, the low-level hum of "I'm never going to catch a fish" began. On cue, a beautiful Idaho rainbow swallowed his fly. Matthew managed to keep his rod tip down, and with a little instruction, reeled the trout in. The net was ready and team Will and Matthew landed a healthy 12-incher. The two boys hooted and hollered as the fish wiggled when they tried to hold it for the ubiquitous fishing picture. It was the first fish that Matthew had ever caught on a fly rod. His somewhat toothless smile stretched from ear to ear. I have the same fishing picture of myself tucked into a yellowing album. When I was 8, my father first waded into a Western river pool with me, angled my body upstream and started to teach me how to cast my rod with his hands over mine. According to Terry, 8 is probably a good age at which to begin to fly fish. Ten might be even better. Loading the rod with line takes some strength and coordination, and fishing with a fly requires quite a bit of patience. It was too pretty of a day, though, to worry about whether the boys were too young for this. We had snacks and a tree swing and an assortment of flies that could catch fish almost anywhere in the world. With the boys muddy, wet, slightly burned and slightly itchy, the day of fishing ended, as all good things must. While the scene may not be one that Norman Rockwell would have painted, it captured the essence of childhood fishing just as profoundly. Still asking for snacks, still wanting to throw rocks in the river, the boys clambered into the back seat of the car. Before driving two miles, their freckled faces began to bob like strike indicators as the sun and fresh air caught up with them. 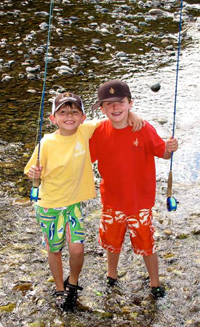 Fly-fishing is an integral part of Sun Valley's recreational landscape. It is a beautiful, lifelong sport and one that I was pleased to introduce my son to. I hope he caught the bug and will be my fishing buddy for years to come. But, then again, Will said his favorite part of the day was the Popsicles, and Matthew said the tree swing. Oh yea, they liked catching the fish, too.